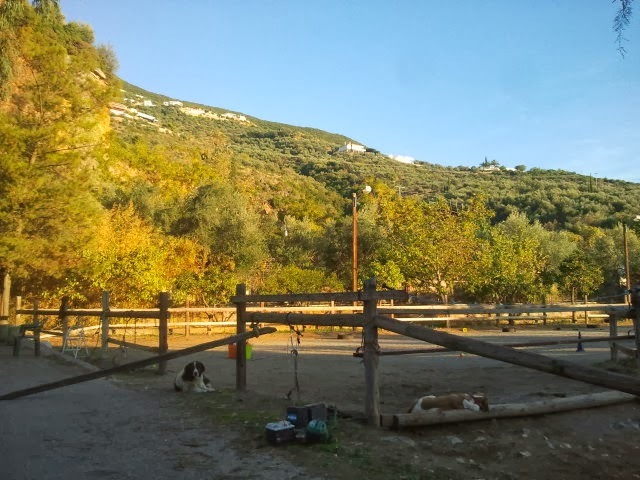 Pure nature, mountains, seaside, lovely street cats, biting horses, barking and killing dogs, crazy sheeps, squeaking pigs, little acrobatics …No, I’m not talking about a circus, I’m talking about my lovely EVS project that is more a hobby than a work for me. Three days per week and two times per day Carmelo and me are cycling the long beach road along to our Coordinator’s home enjoying the sun or freezing into ice. In the idyllic garden full of orange trees and other fruits and vegetables a small black and especially crazy dog is expecting us. His name is Kefdes and his gender is actually still unknown. All together we make our way to the horse riding place close to Verga that is owned by Agnes. 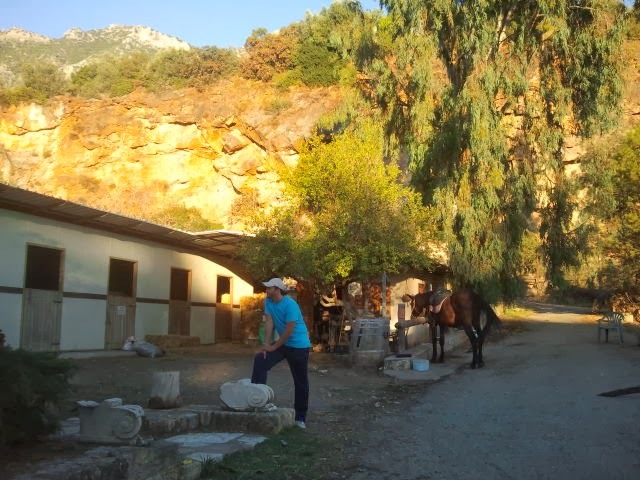 A small mountain chain and citrus trees are surrounding our working and riding place. Next to this you can find the homey place of the horses. The horse that we are always using is Prima. She is very lazy and if she doesn’t want to trot (her steady mood), for sure she will let you know through a quick bite in your arm. Since there are a lot of crazy animals in this place, Prima becomes scared very quickly and that can cause a lot of problems. So you (in this case me) you have to take a lot of care and keep her calm. 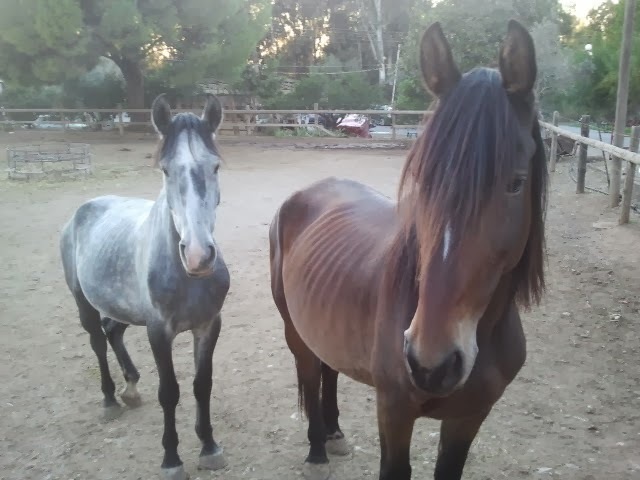 Whereas I take mostly care of the horse, Carmelo is taking care of the children. Also this can be a really dangerous job: Often the small acrobatics hit you with the stick, the ball, and the hammer to wake you up or just pull your hair! But next to all those dangerous risks we take, we also have a lot of fun with the children and learn a lot. Every child has its special needs and is every time in a different mood. That means we are doing individual exercises for each child. Some of them need more gymnastic exercises, some of them exercises to make them concentrate and so on. It is also very interesting and impressing to see how the child is developing and to realise that they develop so fast just because of such simple things. Just sitting on the horse, feeling the movement and imitating can improve the child’s whole movement. We also have a couple of very active and noisy children who only start to relax on the horse. Simple things like cleaning the horses or just to finish an exercise makes them feel proud of themselves and very happy. To see the children like this makes us even happier! The fact that we are working with animals and children which are having all the time a different mood, makes it always very exciting because you never know what is going to happen. For sure there are always coming out a lot of good anecdotes! For me, and I think for Carmelo, I can say that we are very happy about our project to play such an important and necessary role and that we are doing something so effective!